Boxes of chocolate make a classic gift, but they can be expensive. Our custom chocolate gift boxes are a top-quality option that you can buy in bulk to celebrate the accomplishments of employees or clients, to hand out as prizes at your company picnic or to gift during the holiday season. At Promotion Pros we always make sure to offer tons of options, like our triangular gift box with chocolate almonds and promotional chocolate lover's tower, not to mention our hot chocolate on a spoon gift set. 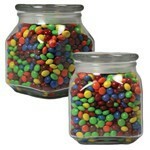 The Medium Square Apothecary Jar features customization ability to add brand imprint on the Assorted Gifts. Make this Oreo Cookies -Milk Chocolate Covered, Foil - Wrapped - 4PC a part of your holiday gifts or thank you giveaways for a memorable sweet reward. Make this Oreo Cookies -Milk Chocolate Covered, Foil Wrapped - 8 PC a part of your holiday gifts or thank you giveaways for a memorable sweet reward. Looking for a sweet way to show your gratitude? You've found the ultimate reward with a Oreo Cookies -Milk Chocolate Covered, Non-Pareils - 4PC . Make this Oreo Cookies -Milk Chocolate Covered, Non-Pareils - 8PC a part of your holiday gifts or thank you giveaways for a memorable sweet reward. Looking for a sweet way to show your gratitude? You've found the ultimate reward with a Oreo Cookies -Milk Chocolate Covered, Non-Pareils - 8PC . Whether you're looking for a small thank you gift or holiday office presents, a Oreo Cookies -White Chocolate Covered, Foil - Wrapped - 4PC is the ultimate sweet reward. Whether you're looking for a small thank you gift or holiday office presents, a Oreo Cookies -White Chocolate Covered, Foil Wrapped - 8 PC is the ultimate sweet reward. Make this Oreo Cookies -White Chocolate Covered, Non-Pareils - 4PC a part of your holiday gifts or thank you giveaways for a memorable sweet reward. 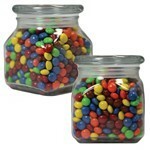 The Small Square Apothecary Jar features customization ability to add brand imprint on the Assorted Gifts.